At Web Store Pty Ltd we knew we had to do something different to compete amongst all the other on line retailers, so we looked towards the software to give us an advantage. All the systems we use have been custom written around the business as it has built and grown. From the web sites to the accounting system right down to the packing and point of sale it has all been designed to make multichannel selling as secure, easy and efficient as possible. So what have we done to make this possible? Rather than use off the shelf software and on line tools which would ultimately restrict us in what we can do and more importantly require the tedious and inefficient double entry of data into different systems, we built our own database and on line shopping system from scratch. This means we can ensure the security or our customers data and change quickly with the emerging trends and changes with selling on line and off. All the details about stock is stored within the database it can then be pushed out onto our different websites and EBay stores. All images,categories, descriptions, prices, costs, weights, supplier details and even SEO (Search Engine Optimization) details are stored in one place avoiding the requirement of double entry. All the order information is imported from the websites and EBay so there is no requirement for data entry and avoids mistakes being made. 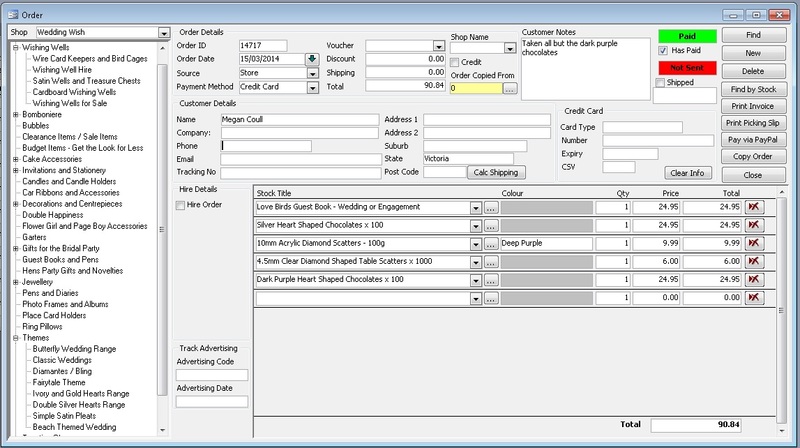 The system monitors when the orders have been paid and shipped as well as hire information. To keep our customers data secure once an order is imported into the database it is removed from the web site. Also for credit card transactions we delete the information once it has been processed removing any record of your credit card information. The picking system uses bar codes to ensure the right products are sent. As all the order details are imported into the system the shipping address entered either from the website or imported from paypal is the same address printed on the shipping label. The picking slip displays the images as well as the the details of the stock to make it easy to find the right product. We also record the parcel weights so we can print the Australia Post manifests automating the entire process. Once an order is marked shipped the system will then send the shipping details to the customer. 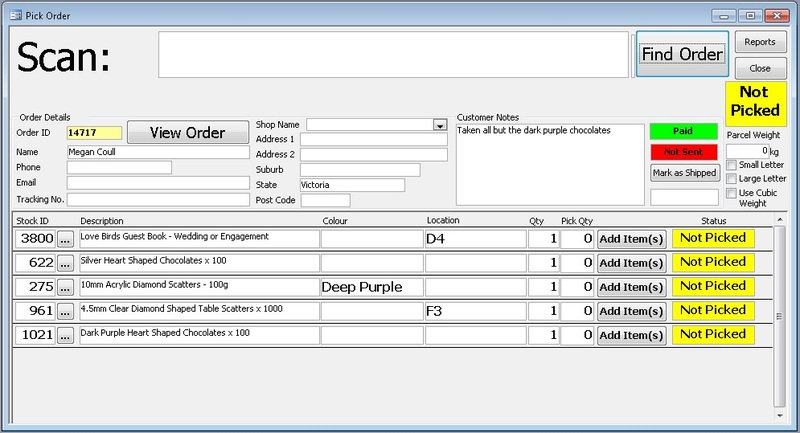 As well as controlling all the online orders the database also provides a Point of Sale system to manage selling products in store. Having all the product details stored in the one system means we can display the images of the stock as it is chosen. 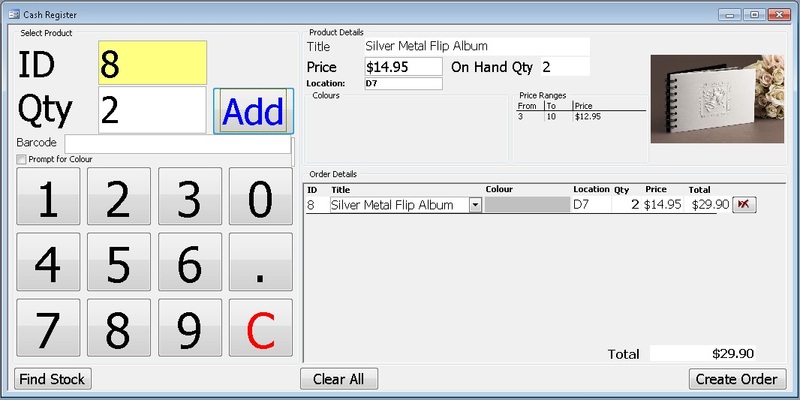 It also uses bar codes and provides an interface that can be used with touch screens. It also integrates with electronic cash drawers. 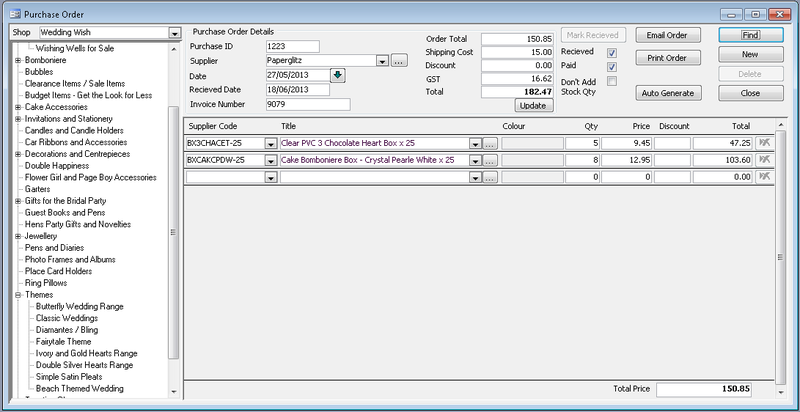 As all the information is recorded in the database the Purchase Order screens can auto generate the orders required to fill the stock requirements. This also tracks which orders are out stranding and records the discounts and GST. All business expenses are kept in the database to allow us to keep track of profits and provide the tax and GST reports. We also implemented a payroll system so we didn’t have the need to keep track of expenses in a separate system. As all the information is kept centrally in the one database we are able to provide a much better level of reporting than would have been possible before. Profits, expense, ans taxes are easy to manage with with reports having access to all the data. Everything from the BAS Statements to the shelf labels can be printed from the one system. At Web Store Pty Ltd we wanted to create a web store system that could be used to control multiple web sites. To do this we have built from the ground up online shopping system that gets all its content from our central database. The database only sends the information required for each individual website to show such as categories and product information. Each website can have it own designs, descriptions, photos and prices making each one unique. All the SEO (Search Engine Optimization) information is also stored in the central database so the website can directly target google and other search engines to get the highest rank possible. To sell on EBay we have built into our database the ability to export and import directly to EBay so all our products can be posted and managed on ebay from our central system. We can directly import the orders from EBay and export our on hand quantity’s removing the requirement of managing two systems.